Central banks in several regions of the World are building up their gold reserves. A large part of these Central Bank purchases of gold bullion are not disclosed. They are undertaken through third party contracting companies, with utmost discretion. The evidence amply suggests that US dollar holdings and US dollar denominated debt instruments are being traded in for gold, which in turn puts pressure on the US dollar. In the course of the last ten years, both China and Russia have boosted domestic production of gold, a large share of which is being purchased by their central banks. In the current context, these initiatives on the part of China and Russia are intended to challenge US dollar hegemony. There is an obvious strategic objective associated with the accumulation of gold reserves. 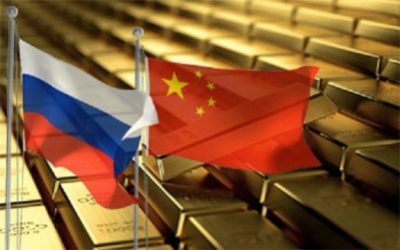 The objective of China and Russia is to build their national currencies under the gold standard, whereby the value of the yuan and the ruble would be linked to the price of gold. Both countries are dumping dollar denominated Treasuries. China is using its extensive treasury dollar reserves to finance large scale investments. 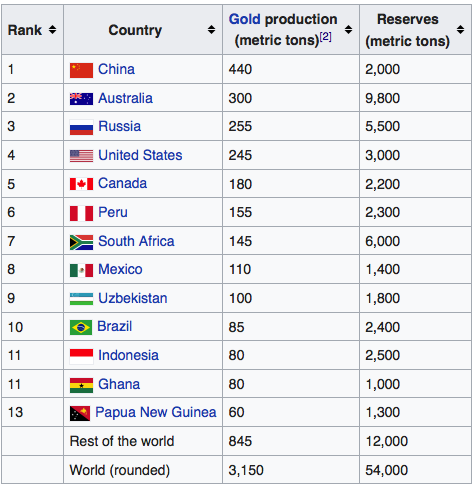 Dominance in physical gold reserves, however, does not necessarily ensure national sovereignty with regard to monetary policy (devoid of dollar hegemony) nor does it ensure control of the international gold market. The price of gold is notoriously unstable. US financial institutions can act against Russia and China without actually possessing physical gold. They are able to influence the gold and foreign exchange markets through various speculative instruments including naked short-selling. The gold market is not limited to the trade in physical gold. It is characterised by numerous paper instruments, gold index funds, gold certificates, OTC gold derivatives (including options, swaps and forwards), which play a strong role, particularly in short-term movement of gold prices. These instruments are routinely used to manipulate the market in physical gold. It’s financial warfare: Those same speculative instruments are also available to Chinese and Russian financial operators including their central banks. Needless to say, they are acutely aware of the instability and manipulative environment which characterizes the gold market. China is currently the World’s largest gold producer followed by Australia and Russia. “It has long been assumed that China is surreptitiously building up its gold reserves through buying local production”. But it is also investing in several gold producing countries. Chinese companies are investing in gold mining in different regions of the World (including South Africa and Australia), largely with a view to establishing a global hegemony on the supply side. 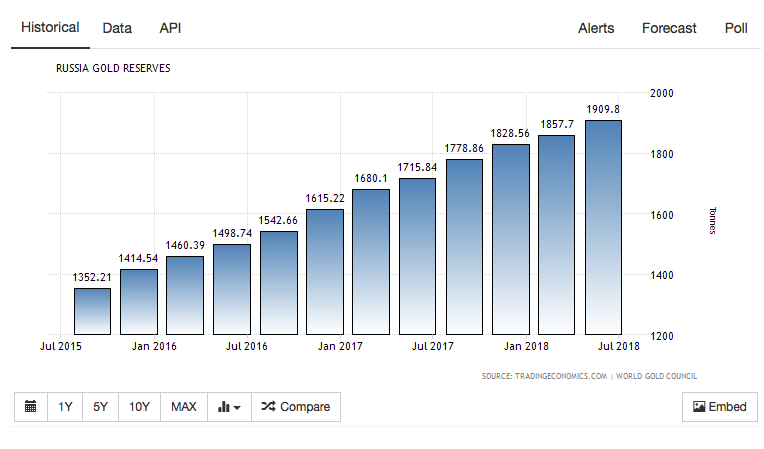 While China’s domestic production is high, its reserves are significantly lower than those of Australia, Russia and the U.S.
Major Chinese firms will ramp up investment in foreign gold mines, …. Graph for 2017: Wikipedia, quoting “Where Have All the Gold Mines Gone?” and “U.S. Geological Survey, Mineral Commodity Summaries” (PDF). USGS. 2017. The Russian Central bank purchases gold from a Russian state company “Gokhran, which is the marketing arm and central repository for the country’s mined gold production”. Mineweb. 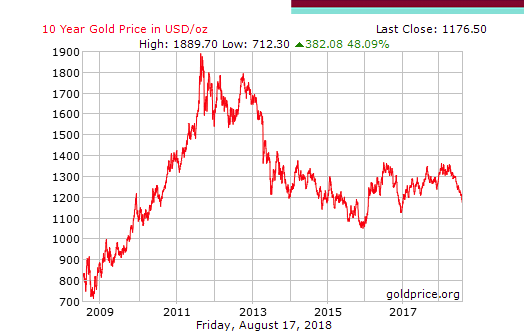 Recent reports (April 2018) confirm that Russia purchased 300,000 troy ounces of gold in March 2018, i.e. 18.66 metric tons. Russia’s Central bank holdings were in excess of 20 million troy ounces or 622 tons (January 2010). The latest figures (July 2018) confirm that gold reserves of the Russian Federation have more than tripled since 2010. They currently stand (July 2018) at 1909.8 tons. (see diagram below). There has been an upward trend since January 2017. Turkish media Yeni Safak suggests that the Erdogan government had ordered in 2017 the repatriation of “all of its gold stored in the U.S. Federal Reserve” i.e. 220 metric tons. it would appear that the run on the Turkish Lira in 2018 has been conducive to a major collapse in Turkey’s Central Bank reserves. The published World Gold Council figure for July 2018 remained to be fully corroborated. As mentioned earlier, the sale and purchase of physical gold are not the only factor in explaining the movement of gold prices. The gold market is marked by organized speculation by large scale financial institutions. The price of gold is an instrument of financial warfare. In the present context, Wall Street is intent upon manipulating the gold market.